It’s officially fall, and if you’re a Florida homeowner who takes care of your own lawn and landscaping, there are a few things you should do in October. While we’re still getting some residual summer afternoon downpours, it’s starting to dry out in October. It can be a tricky time of year irrigation-wise. If your sprinkler system doesn’t have a rain sensor, monitor your turf. When you see grass blades folded in half and the overall turf color turning bluish-gray, run the sprinklers. The grass should receive ½ to ¾ inch water. Grass is still growing in October but in general it isn’t heat-stressed like it can be in the summer, and nor are the roots water-logged from daily summer rains. It’s an ideal time to add new turf or replace problem areas that may be struggling due to pest activity, too much shade, weeds, or lack of water. If your grass is yellowing, apply iron to green it up. Most warm-season annuals are still thriving in October, especially in central and south Florida. In fact, you can keep planting warm-season annuals if you want. But it’s the month to be thinking about transitioning to cool-season annuals and starting to get beds ready for them. 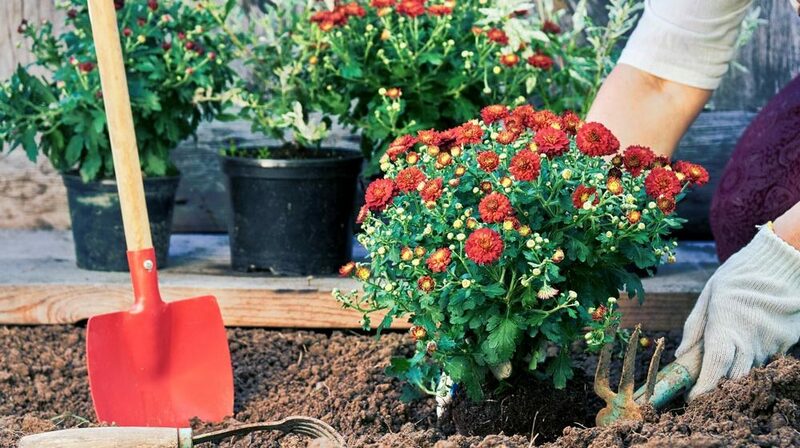 November and December will be the time to plant cool-season annuals. If you like to grow annuals from seed, October is the month to sow them. Popular annuals to grow from seed include pansies, dianthus, snapdragons, and petunias. Keep an eye on your perennials to make sure they’re getting enough water. Refresh mulch layers to a depth of 2-4 inches. Don’t allow mulch to closely surround the base of the plant as that can lead to root rot. Apply a final fertilizer treatment for the year. October is a good month to add chrysanthemums to your landscaping; many local stores and nurseries carry them. They look good as container plants, as do blue daze, lantana, Mexican heather, pentas, and salvias. A number of citrus varieties will have ripe fruit that’s ready to harvest, including Satsuma, Ambersweet, navels, Hamlin, Fallglo, Robinson, and Osceola. Some fruit is ripe even though it’s green. Don’t wait for it to turn orange. Taste a sample fruit to determine if the crop is ripe and ready to eat. Do not spray citrus trees for pests. You shouldn’t have to because by October, pest activity has lessened. Save the spraying for later, after the harvest has been picked. October is a good time of year to add new trees and shrubs to your landscaping. The heat, being less intense, won’t stress the plants. They will need to be watered, however, until they’re established. Water daily for a couple of months, then every other day for several months. Established trees and shrubs should have been fertilized in September. If that feeding was missed, apply the fertilizer in October. A general lawn fertilizer (with no weed killer in it) is fine, cast over the ground from the trunk to just past the drip line.